The massive influx of Venezuelans is an undeniable reality. And even though Venezuelan restaurants in Buenos Aires have existed for some time, now more than ever the Caribbean country is really making a statement in the Argentinian capital. Competition also encourages better-quality, more authentic ingredients and flavours. I recommend this hole-in-the-wall with my eyes closed because the food is just excellent. High quality Venezuelan food, but still realistic and authentic. Their arepas are tasty and juicy. Lunch formulas follow the Venezuelan classic: “sopa + seco + jugo” which translates as “soup+main dish+juice”. Our number one recommended dish here is the traditional PABELLÓN: rice + black beans + fried plantain + shredded meat. 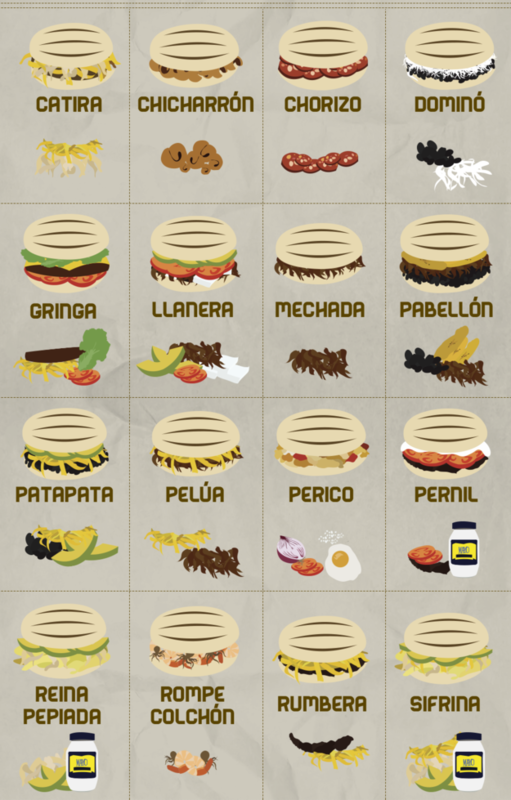 Wherever you are in the world, you probably know what arepas are by now. There are many good arepas in Buenos Aires at this point (including those you cook at home with other Venezuelan expat friends). But I can say my favorites are from Guaica (above) and Mestizos, a place that’s actually owned by Guaica’s owner’s brother. So it’s all in the family. Venezuelan empanadas are always fried and made of ground maize flour just as arepas. In Buenos Aires, La Carbonera specializes in the field. You get the classics like chicken, meat or cheese empanada; or more regional flavors like empanada de cazón (school shark meat), very popular in the well-known Caribbean island of Margarita. Tequeños are delicious cheese sticks (fried, breaded and filled with Venezuelan white cheese); extremely popular at parties and any form of celebration. You will find them in any of the places mentioned above, or you can get them delivered to your door by TequePops, arguably the best in Buenos Aires. Venezuelans are experts in the art of greasy, unhealthy, almost obscene street food. So if this is your kind of guilty pleasure, then go try Venezuelan-style burgers, hot-dogs and sandwiches at Panachef. A must-try there is “Patacón maracucho” a specialty from my hometown: fried plantain sandwich with cheese, tomato, bacon, eggs, shredded meat, sweet fried plantain slices and a LOT of different sauces. Starting with my beloved Pirulín (rolled thin sticks filled with hazelnuts and chocolate – someone told me they’re sold as “pirucream” in the US), all the way to Platanitos (salty plantain chips), you can get many of the snacks from our Venezuelan childhood at Venestore. There’s also a place called Waffles Pop with a good stack. Actually, there’s no Venezuelan coffee in Buenos Aires. Imagine export challenges in Venezuela meeting import challenges in Argentina… it’s hard to get those coffee beans here. However there are several specialty coffee shops owned by Venezuelan expats where you can get arepas with your latte, for example: Serendipity, Hacienda and Algrano.